It’s not exactly the Hogwarts School of Witchcraft and Wizardry, but Harlaxton College in the beautiful English countryside an hour north of London is about as close to the fictional world of young wizard Harry Potter as most Florida Gulf Coast University students are going to get. That’s why for Chandler Burwell and Kaliegh McFadden — two FGCU students who grew up following the fantastical adventures of British author J.K. Rowling’s young good wizard and his friends in their battles against evil wizard Lord Voldemort — the chance to spend a semester studying in England was almost a childhood fantasy come alive. 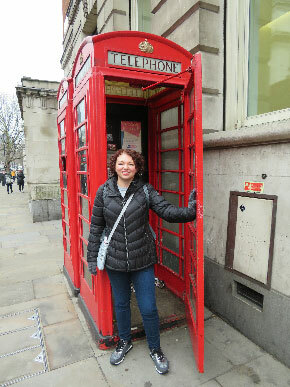 “As an avid Harry Potter fan, the thought of being able to practically live in Hogwarts while I explored England and Europe was like a dream come true for me,” said Burwell, a Clearwater Beach resident who spent spring 2018 at Harlaxton. But once Burwell and McFadden spent a few months studying at Harlaxton in a 100-room Victorian manor house and got fully immersed in British culture, their study abroad experience turned out to be a lot more meaningful than a magical literary escape. The experience these students realized takes place on the British campus of the University of Evansville (Indiana). 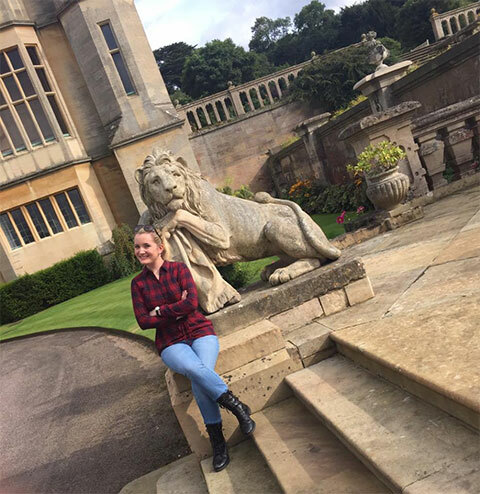 Harlaxton College has been operating for more than 40 years, and the program is designed to give American college students an intensive study abroad experience in England. About 75 American students from 20 different partner schools — including FGCU — attend Harlaxton each semester. The program is one semester or one summer term, and students take a full 12 or 15 credit hours of classes, six hours of which are a British Studies core class taught by British faculty. That intensive, team-taught, interdisciplinary course — which Harlaxton calls the program’s “centerpiece” — focuses on the history, culture, arts, economics and politics of England presented through a combination of lectures, seminars and travel. Also, a variety of humanities and social-science courses are offered each semester so students can progress toward graduation in their respective majors. “I wanted to make sure that FGCU students had the opportunity to study at Harlaxton and have life-changing experiences like I had seen other students have,” said Motley, who coordinated the Harlaxton program at his previous university, Western Kentucky, before coming to FGCU in 2015 to lead what was then called the Honors Program. But we don’t just have to take Motley’s word on that. Consider the personal experiences of students Burwell and McFadden. “Once they told me that people who join the program get to live in the manor, I was instantly hooked and started doing some serious research into the program,” said Burwell, now a junior. The manor, built in 1837, is considered unique among remaining Jacobethan-architecture estates as it combines elements of that style and Elizabethan style with symmetrical Baroque massing. Besides a higher-education shrine, it’s a popular film location. Senior psychology major McFadden, a Naples resident who minors in creative writing, said taking classes in the manor was her favorite part of the academic experience. “I don’t think I’ll ever be able to top having lessons in The Great Hall,” she said. So, what advice would these more-worldly students give to peers considering a semester at Harlaxton? It sounds like these Eagles are grateful for the experience. You could even say they followed the wizardly advice they first learned about in childhood, a signature line from “Harry Potter and the Sorcerer’s Stone”: It does not do well to dwell on dreams and forget to live.